Mönchengladbach (German pronunciation: ), formerly known as München Gladbach is a city in North Rhine-Westphalia, Germany. 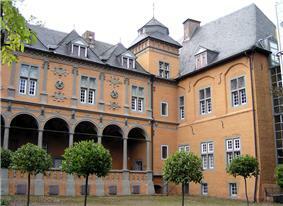 It is located west of the Rhine half way between Düsseldorf and the Dutch border. Mönchengladbach is home of the football club Borussia Mönchengladbach, Formula One race car drivers Nick Heidfeld and Heinz-Harald Frentzen, author/cartoonist Walter Moers, cabaret artist Volker Pispers, philosopher Hans Jonas, Goalkeeper Marc-André ter Stegen and the former football players and managers Günther Netzer and Jupp Heynckes. Joseph Pilates, the creator of the Pilates method of physical fitness, was born here in 1883. The original name of the city was Gladbach, which is even today often applied to the town. To distinguish the town from another town of the same name (the present Bergisch Gladbach), it took the name München-Gladbach in 1888. This spelling could mislead people to think that Gladbach was a borough of Munich (München in German), and consequently the name was changed to Mönchen-Gladbach in 1950 and Mönchengladbach in 1960. The origin of the town was an abbey founded in 974. It was named after the Gladbach, a narrow brook, that mostly runs subterraneously today. The abbey and adjoining villages became a town in the 14th century. The town of Rheydt is located nearby and is incorporated into Mönchengladbach today. On 4 October 1794, the armed forces of the French revolution marched into the town, one day before the fortress Jülich had been handed over. When the Holy Roman Emperor Francis II ceded.the left bank of the river Rhine to France with the Treaty of Lunéville in 1801, Gladbach fell under French laws suppressing religion. This was the end for the abbey, and the monastery was closed. 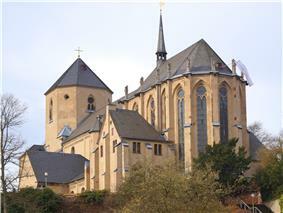 On 31 October 1802, the last 31 monks left the monastery. The contents of the tremendous abbey library, well-known outside of Germany, was scattered or destroyed. In response to the 10 May 1940 German invasion of Belgium, Mönchengladbach was bombed by British Bomber Command on the evening of 11–12 May. The bomber crews were attempting to interdict German troop movements on roads, intersections and rail lines in the area, especially the city's railyards. About half of the approximately 36 twin-engine RAF bombers reportedly hit their targets, and three were shot down. Four people were killed on the ground, including a British woman living in Germany. Eventually, the Prussian Rhine Province was dissolved after World War II, and the city became part of the new state of North Rhine-Westphalia. 1983, 7 December, Sascha, Crash, Benders, German Professional Gamer, who has won several MLG events world wide. Mönchengladbach has a long football tradition. Its home club Borussia Mönchengladbach is one of the country's most well-known, best-supported, and successful teams. Die Fohlen ("The Foals") with more than 50,000 members is rated actually as fourth largest fan-club in Germany. Famous for the attacking style, Gladbach belonged to the strongest European football teams in the 1970s, winning the Bundesliga 5 times. The Club lost the 1977 final of the European Cup to Liverpool, but also made four appearances in the UEFA Cup final with wins in 1975 and 1979 against losses in 1973 and 1980. However, after a last place finish in the top flight for the 2006–2007 season, they were relegated to the 2. Bundesliga (1. and 2. National Leagues) for the 2007–2008 season. They are playing in the Bundesliga again since 2008, surviving relegation in the 2010–2011 season and finishing 4th in the 2011-12 season. 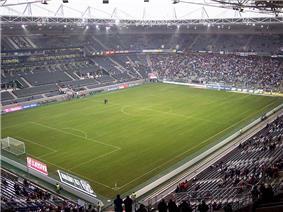 On 30 July 2004 the opening of the new stadium "Borussia-Park" was celebrated. It has a capacity of 54,700 visitors (seated: 34,300, standing: 20,400 / capacity on International games: 45,600). The stadium can be reached by car (through dedicated exit on the Autobahn "A 61"), bus and train. The city hosted the FIH Hockey World Cup 2006 during the period of September 6–17 and the 2010 FIH Champions Trophy in July/August that year. Since 1892, Mönchengladbach owns a harness racing track called "Trabrennbahn Mönchengladbach". Just outside Mönchengladbach is the Rheindahlen Military Complex, home to the headquarters of the British Armed Forces in Germany. Mönchengladbach has also an AFN broadcasting station, which broadcasts on 1143 kHz with 1 kW the programme of AFN PowerNet for militair staff and their families in Rheindahlen Military Complex and other military facilities in Mönchengladbach area. It uses as antenna a 45.5 metres tall guyed mast radiator insulated against ground, which was built in 1955.